DP President Sebaana's campaign hit the road to the East this week. 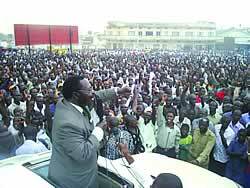 Highlights of his rallies included mammoth crowds in Jinja, Iganga and Mbale; The rally in Mbale is pictured left. He promised to reverse the privatization of strategic sectors in the economy including energy where UEB was sold to another state owned enterprise Umeme. He hit very hard on jobs and unemployment which are symbols of an economy that has lost traction. Sebaana also clarified that there is no formal alliance between FDC and DP informing DP supporters that DP is the most credible political party to lead Uganda.